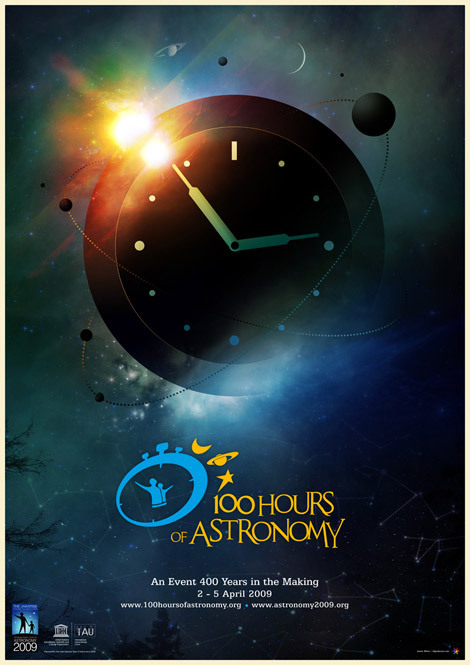 Here is my poster design promoting the 100 Hours of Astronomy worldwide event happening in April, put on by the International Year of Astronomy 2009. After creating my New Years graphic in early January featuring the organization, I was asked if I would be interested in creating a poster for this global event. The 100 Hours of Astronomy Cornerstone Project is a worldwide event consisting of a wide range of public outreach activities, live science center, research observatory webcasts and sidewalk astronomy events.One of the key goals of 100 Hours of Astronomy is to have as many people as possible look through a telescope as Galileo did for the first time 400 years ago. 100 Hours of Astronomy will take place from 2-5 April when the Moon goes from first quarter to gibbous, good phases for early evening observing. Saturn will be the other highlight of early evening observing events. Space is the place, so be sure to get out your telescopes. For more information on what is happening in your area, check out the 100 Hours of Astronomy website. It looks awesome James, I love it! Did you come up with the logo as well? I just love the look and feel of the whole piece. It feels very fun, youthful and mysterious. All perfect emotions for the event you created this for. Even though this poster was done as a commissioned illustration, I think I like it most out of all your work. It really leads your eye to look at the subtle details like the trees in the lower left. Keep it up! Beautiful work. Shame about the logo, though. I wish it encompassed some of the detail of your pasta retro cosmic work. But you’re the artist, and this is just one guy’s opinion. This is awesome, James. You got to post a tutorial someday to show how you make one of your pieces. I like the one you brought in Computer Arts really much. Thank you for a wonderful site. Andrew, thanks! No, I was provided the logo from the IYA. I would assume they had all of the branding complete for the years’ events long before 2009. Mr Carlsen, I plan on making more posts in the future outlining some of my processes and techniques, the trick is really to find the time to write them up. Hopefully soon. Jim, just because you have NO talent doesn’t mean you can post rude comments on someones PERSONAL site. Would of loved to of seen a nice flared digital clock of stars. The bottom of the clock and the deep blues around it are awesome though. Don’t mean to be pushy but any idea when Legacy 2600 will be available again? This is just really awsome. I can see some same technique-styles just like the one you wrote a tutorial of, which was also done by Abduzeedo. Nice poster dude. The colours are terrific and so are the details. Has a very nice feel and mood to it. I actually think the logo looks pretty good in that context. Reminds me of the lemony snicket’s unfortunate events dvd cover typeface. Simon, I will be offering Legacy 2600 again very soon. I am currently planning an order from the printer to replenish my stock, and Legacy is included. I’ll be sure to announce when it’s available. Did you choose 2:54 because of 2 – 5 April? Pardon me if that’s plainly obvious. I’m new here.